After seeing so many creative clip charts on teaching blogs, I've decided to give this behaviour management technique a go this year. The idea is simple: Everybody has a clothes peg. Everybody starts the day on green. The children are asked to move their pegs up or down according to how they behave. I am teaching 5 and 6 year olds this year and so far, have found this technique really effective. The children get really excited about moving their pegs up. It's great for trying to target specific behaviours e.g. "I will move everybody in the most cooperative group up after this activity. They also really don't like moving it down. A very calmly worded, "Please move your peg down" is a lot more pleasant than raising your voice and getting angry. 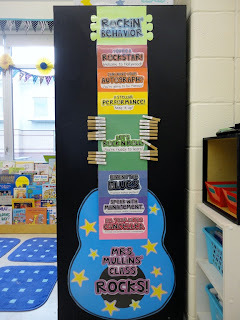 The clip chart I have been using is from Jessica at Under the Alphabet Tree. You can download it for free from her TPT store.